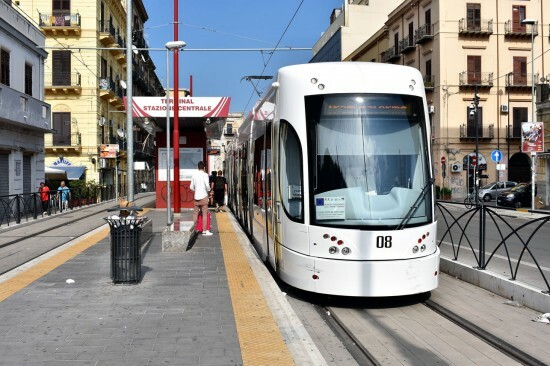 This week we stay on Sicily to feature more images from the tramway in Palermo. This time we take a look at Flexity Outlook no. 08. 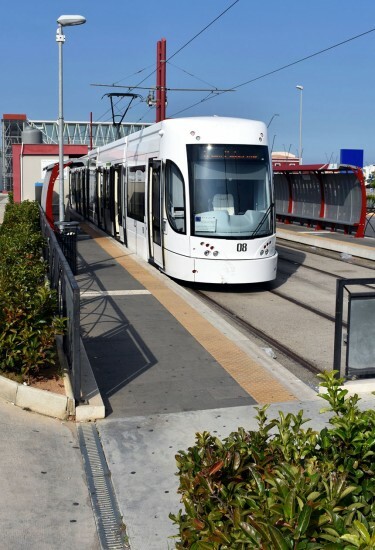 With a current four route network financial approval was given in late 2018 for four further extensions which will join up with the existing lines and take the trams through the heart of the city. As we mentioned last time out a fleet of 17 Flexity Outlook trams operate the current service and below we have a couple of images of no. 08, once again the all white livery. This first shot shows 08 awaiting departure from the Stazione Centrale terminus of route 1 in Via Paolo Balsamo. This tram stop is slightly hidden away down the eastern side of the FS station. Then in the below image we see 08 on arrival at Roccella. This stop can be found in the middle of the car parks for the shopping centre. Both images taken on 17th September 2018. This entry was posted in Around the World in Trams. Bookmark the permalink.